Frankford Pavilion is located along the Dallas North Tollway, one of the most heavily traveled arterials in Dallas. Village by the Parks II is located on the most traveled thoroughfare in South Arlington and sits at the stop light controlled main entrance to the 1.5 million square foot Parks at Arlington regional mall. 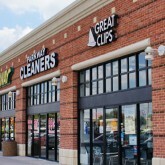 Coppell Retail Center is prominently located in the Town Center district along the main north/south arterial in Coppell. Midway Commons is conveniently located less than 1 mile north of I–635/LBJ Freeway and just west of the Dallas North Tollway. Village by the Parks is located on the most traveled thoroughfare in South Arlington and sits at the stop light controlled main entrance to the 1.5 million square foot Parks at Arlington regional mall.